Question: What do great Australian Open hope Ash Barty, seven-time world surfing champion Stephanie Gilmore, Richmond captain Trent Cotchin, AFL premiership coaches Alastair Clarkson and Damien Hardwick and, more recently, the Australian cricket team, have in common? Answer: performance coach and professional mentor Ben Crowe. "Ben has become a massive part of my team - particularly in the last what, eight, nine, 10 months, and he’s worked with other athletes as well,’’ Barty revealed exclusively to Wide World of Sports ahead of one of the biggest matches of her career. "Just helping me with my mental application, I suppose, and changing my perspective of things in both life and in sport.’"
Crowe declined to comment specifically on Barty, citing client confidentiality, but confirmed the collaboration began after Wimbledon, where the grasscourt-loving Queenslander lost in straight sets to Russian Daria Kasatkina in the third round. 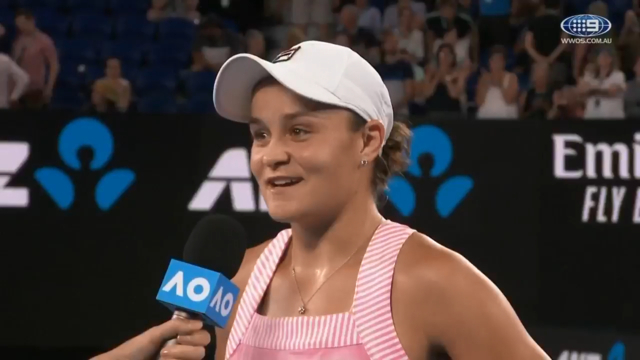 "A bit of a turning point" is how Barty describes the disappointing result at the All England Club that has been followed by some of the best form of her career. She has since compiled a 24-7 record at WTA level, won her biggest career title (the year-end WTA Elite Trophy in Zhuhai), was a finalist at the Sydney International, reached the last 16 at Flushing Meadows and now Melbourne Park. The Crowe-Barty connection is believed to have been facilitated by Barty’s Melbourne-based coach Craig Tyzzer, who has been laid low with illness this week, but continues to play a key role from his sick bed as Fed Cup captain Alicia Molik warms his usual seat at courtside. Meanwhile, Crowe is in the back row and - determinedly - in the background, but his own story is a fascinating one. Once the youngest director at Nike, the successful businessman remains a close confidante of the likes of Andre Agassi and Cathy Freeman, and plans to devote himself to mentoring for the next 12 months at least. The themes he typically focuses on with clients involve "unlocking authenticity, vulnerability, connection, and performance mindset". At 22, Barty is learning all the time, and mentally, in the best place she has ever been. On Sunday, she returns to the Australian Open's biggest stage chasing a personal grand slam best, the longer-term members of her close-knit team having been augmented by a significant recent addition.